If you can get into the habit of keeping your freezer well stocked with meals then you'll always have something delicious to eat even when the funds are running low. When you're cooking it's usually very easy to just increase the amounts and freeze a couple of portions of the meal for future use. There's really no extra effort involved as you're cooking anyway and it's just a case of buying a few extra ingredients. You'll find that you actually save money by doing this. Plus, a full freezer won't require defrosting so often, so you're saving yourself some housework, too! So many things can be frozen that it really is crazy not to make the most of this extra food storage space. If you only have a small freezer compartment then you'll need to be a little more disciplined and make a concerted effort to use food up and not leave unidentified plastic containers festering there for months. You can still cook in bulk anyway, as food that's kept in an airtight container will keep in the fridge for a few days (obviously depending on what it is - don't start tucking into any leftover prawn curry that's been sitting around for a while). You might not get quite so much variety in your dinner for a few evenings after cooking day, but just make sure it's something you enjoy and vary the vegetables and accompaniments! If you're making cottage - or shepherd's - pie, just double the ingredients, dig out another oven- and freezer proof dish and make twice the amount. Alternatively, you could make one big dish and then divide the remaining amount between two or three smaller dishes so that it's convenient for individual servings. As with cottage pie, just make twice the amount and freeze one dish for another time. You'll be really chuffed with yourself one evening when you think you've got nothing for dinner but a couple of pieces of toast and then you remember that delicious homemade lasagne sitting in the freezer! 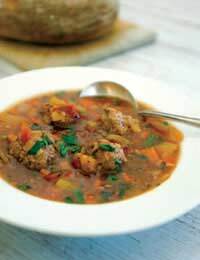 Try making extra quantities of chicken or vegetable casserole and freezing some of it. This is a great food to make in bulk and it's really quick and easy too. Choose the flavour depending on what's in the cupboards. Always label your freezer food. Although mystery meals might liven up an otherwise boring evening, it's better to be able to choose what you want to eat. If you add a date you can make sure you use the older items first. For a more speedy meal and less washing up choose containers that are ovenproof, microwave proof and freezer proof. Always allow food to cool down before putting it in the fridge or freezer. Otherwise you'll simply increase the temperature inside the appliance. Try to use up your food in rotation. For example, put any new food at the bottom or towards the back of shelves, so that older items are more easily accessible. For no extra time and effort, you can make twice the amount of food and have double the meals at your fingertips. Get into the habit of doing this and it will become second nature.